you do not have to be a king to play polo. You do not need a 300-yard grass field, a long-handled mallet or a helmet. In fact, you do not even need a horse. On asphalt courts and parking lots in cities throughout the country, bike messengers, bike-shop employees and assorted cycling enthusiasts are playing bicycle polo. The game dates to the 1800s, but it is being transformed from its prim beginnings to a rough-and-tumble sport as it mixes with bike-messenger culture. Urban players ride fixed-gear bikes, the kind messengers often use to zip through traffic and dodge pedestrians. They set up orange cones in lieu of goal posts and knock around street-hockey balls. Because wooden mallets often break when hit against concrete, players make their own mallets, attaching a handle from an old ski pole or golf club to a piece of industrial-strength piping. In downtown New York, on a court shaped like a large asphalt bowl, a group meets every Sunday for pickup games. When Doug Dalrymple, a former bike messenger who now is a food deliveryman, started playing last summer, 10 players regularly showed up, he said. The number has at least doubled since then, with many more 20- and 30-somethings going to watch. Hilliard’s team and others from the United States and Canada will compete in the East Side Polo Invite this weekend at Sara D. Roosevelt Park in Lower Manhattan. The tournament will be composed of 10-minute games and will feature social events like a bike prom. Hilliard’s team is called the Broad Street Bullies. Dalrymple’s is the Ratkillers. On a recent Sunday, the two teams played an unofficial preview match, the three players on each team positioned at the far ends of the court. They rested their mallets on the ground and slid their feet onto the pedals. After a cry from the sideline of “Three, two, one ... Go,” the teams raced for the ball in the center of the court. Hilliard, the only player who wore protective gear — his sticker-covered helmet and white sunglasses obscuring most of his face — came away with the ball. But Dalrymple cut off his path as he plowed toward the goal. Hilliard whacked the ball through the wheels of Dalrymple’s bike, and their mallets tangled. Hilliard’s snapped in half. “Mallet, mallet, mallet,” Hilliard yelled, and a player on the sideline tossed him a new one. Contact is allowed in urban bike polo. The rules of the game — which are few — have been adapted from equestrian polo to work in the small spaces available in big cities. The most important rule is that the players’ feet cannot touch the ground. If a player’s foot touches down, he must ride to the sideline and touch an orange traffic cone with his mallet before returning. “It’s kind of like a power play in hockey,” Hilliard said. The United States Bicycle Polo Association promotes a grass-court version of bike polo in which collisions are discouraged. The organization’s director, John S. Kennedy, said there were competing stories regarding the origin of the sport. As the story goes, British soldiers stationed in India took the game back to Britain, where it became so popular that it was played as a demonstration sport at the 1908 Olympics in London. 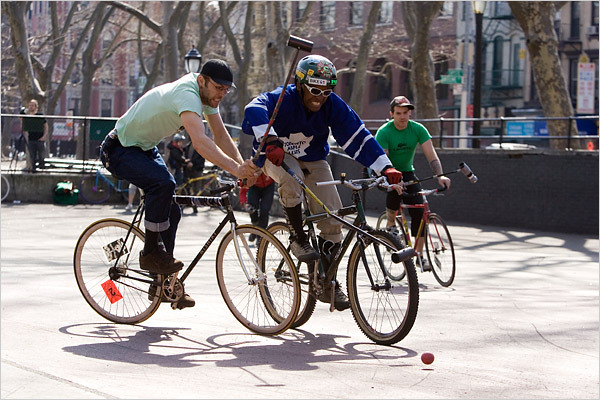 According to Kennedy, bike polo has enjoyed several bursts of popularity through the years. “I hear from people all the time, ‘We played with croquet mallets or hockey sticks and we thought we invented the sport until we found your Web site,’ ” he said. Back on the court, Dalrymple charged toward Adam Staudt, a 27-year-old messenger who had broken away with the ball. Staudt lifted his mallet, hoping to strike for a goal in the split-second window of opportunity. But before he could make contact, Dalrymple knocked the ball away from behind. As Staudt leaned his bike to try to recover the ball, Dalrymple’s mallet got stuck in his spinning spokes. Staudt was sent flying onto the pavement. “They’re really, really physical,” he said. The Ratkillers won the game, but the competition may be different at the East Side Polo Invite. Dalrymple said that he expected teams from others cities to show off moves he had never seen.